Kopp Glass' Research and Engineering team, which includes optical, material, and mechanical engineers, works closely with our customers to provide application specific technical support to overcome complex challenges. We provide comprehensive design services though a fully integrated facility with sophisticated glass testing and simulation and measurement equipment. Engage our experts to optimize designs for application and manufacturability. 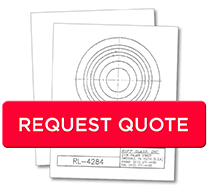 We design custom lenses and light covers for a wide range of industries. Our engineers are experts in light distribution and can create custom optical lenses designed to concentrate, diffuse, spread, or deflect light at desired transmission and photometric output specifications. We can accommodate challenging engineering specifications and produce designs utilizing emerging light source technologies. Our custom designed Sapphire Goniophotometer allows us to easily test between aerospace and airfield lighting requirements. Our accurate and efficient photometric testing procedures guarantee compliance with rigid FAA and ICAO lens specifications.